A report has estimated that if fire ants are not wiped out in Australia they could be responsible for up to 3000 anaphylactic reactions each year. An independent review, or a supposedly independent review, has warned that the window of opportunity to eradicate the red fire ant is closing. You would know that this pest was imported into Queensland in 2001 and, so far, nearly $400m has been spent on it. Now a new report, tabled in Federal Parliament, has called on the Federal government to redouble its efforts. And yes: more money is needed. Someone who’s a sceptic of this, is someone who sat up last night reading the report. Dr Pam Swepson who was a senior policy officer in the Department of Primary Industries has been a constant critic of how Queensland has handled the eradication program. She became a whistle-blower, although her whistleblowing was rejected by the Crime and Corruption Commission here in Queensland. Pam Swepson, you sat up and read the latest report and you see it as a money grab. Tell me why. PS I’d have to agree with the report that we do need more money, but my concern would be about giving it to Biosecurity Queensland. PS Because Biosecurity Queensland has wasted $350-400m of public money only to see the infestation get ten times bigger than it was. The independent review makes the claim that thirteen previous reviews have found that the program was sound. Those reviews do NOT say that. Previous reviews have been very critical of the program’s ability to contain fire ants. This current review is (I suggest) too close to Biosecurity Queensland and is claiming that the remote-sensing technology (for detecting fire ant nest by helicopter) has delimited the infestation and therefore eradication is on track. That helicopter surveillance found a whole 38 nests while it identified thousands of rocks and lumps of manure as nests. (But the technology) MISSED hundreds of nests that the public found. So, the remote-sensing technology has not worked. SA So your argument is that the remote-sensing technology is very expensive and has not been successful (in doing what) it was aimed at. PS And while they fiddled around with that, the infestation tripled. We’ve now got the Port of Brisbane, which the program has been claiming had been eradicated, back on the fire ant maps in July. And fire ants have been found beyond that map already with new infestation in Brookfield and Bracken Ridge. And Biosecurity Queensland’s constant claim (for failing to eradicate fire ants) is ‘It’s not our fault. It’s the Commonwealth government’s (fault) for not giving us certainty about funding.’ Now the 2006 review certainly said (the problem was) more about poor management decisions than about funding. And the Capability Review of biosecurity in Queensland in 2015 also said that part of the problem was that Biosecurity Queensland cannot give funding bodies a business case for future funding, because Biosecurity Queensland make poor management decisions and has no performance information to support (future funding) claims. So, I am saying, for goodness sake, we do need more money. I totally agree with that. I really do think we need to start again: with a new program, with more money. But don’t give it to Biosecurity Queensland. 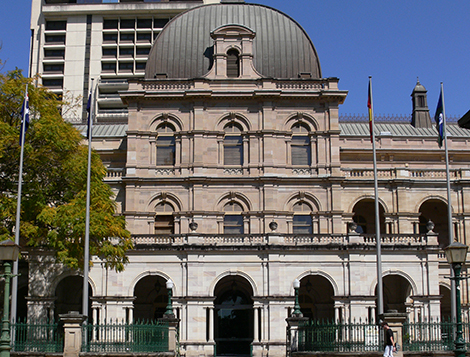 Biosecurity Queensland was never intended to be part of a government department. It was intended to be a stand-alone, science based, independent biosecurity agency. At best, give the fire ant program to the (Queensland) Department of Environment. But don’t give it to Biosecurity Queensland. Unless you give it to a totally different agency, and start afresh, the Commonwealth is going to be throwing good money after bad. SA So you think (giving the program and money to Biosecurity Queensland) will simply be repeating the failures. We’ve spent nearly $400m of tax payer money so far on an eradication program that has not eradicated anything: indeed it’s expanded in places that were declared fire ant free. (They) have had to be put back on the register. That we will simply be repeating all of the mistakes of the past. PS And the (latest) report makes the point that a miniscule fraction of the budget is being spent on movement controls and containment (when human- assisted movement) is the MAJOR cause of the spread. So, this is what we’re going to get, however much money we give to Biosecurity Queensland. (With Biosecurity Queensland) we’ve seen the infestation get ten times worse. Are they going to make it one hundred times worse? So, (the program) really does need to be given to a totally different agency to manage. SA I’m talking with Dr Pam Swepson. She was a senior policy officer in the Department of Primary Industries for many years. She’s been a constant critic of how Queensland has handled the fire ant infestation that started in 2001. SA Found in 2001. My apologies. PS They had been here ten years before that. SA Ten years before (they were found). I should also point out that Dr Swepson went and claimed whistle-blower status but this was rejected by the Crime and Corruption Commission. This is 612 ABC Brisbane. We’re talking about a new report, tabled in Federal Parliament, that’s calls on the Federal government to double its efforts and spend another $380m over the next ten years to stop fire ants spreading. SA Pam Swepson, you’ve previously told me that one of the concerns you had about this program was that merely using the word ‘eradicate’, triggers federal funding. In other words, if it was a containment program, which you apparently favour…..
PS I only favour a containment program because it’s the first step to eradication. SA But at the moment, they’re using an eradication strategy which triggers massive Commonwealth funding. You feel that this is why the State is say ‘we can eradicate it’ when really what they’re trying to do is to access federal funds. PS That’s correct. And all of the money has gone into surveillance and treatment instead of anything that looks like containment which is movement controls. PS It’s the crazy science behind it. If you can’t contain fire ants, you can’t kill them. But (Biosecurity Queensland has) put all the money and all the effort of the program into helicopter surveillance to find them and baits to kill them. But whatever program you have, whether you are going to contain them or to eradicate them (you have to contain them first) That’s what the 2009 review of the program said ‘If you can’t delimit them, if you can’t put a boundary around (the extent of the infestation), you can’t do anything. I’m only pushing for a containment (program) as the first step towards ANYTHING. If you can’t contain fire ants, you can’t eradicate them. And there has been NO effort put into containment. We’ve got a handful of biosecurity inspectors and a minimal fraction of the budget goes on containment when (human-assisted movement) is the MAJOR cause of fire ants spreading. SA So you’re questioning the scientific methods used to eradicate or contain these fire ants? PS The (2015) Capability Review said it was the strategic and management decisions behind the whole program that are flawed. SA Who said the management or the strategy behind the whole program was flawed? PS The Queensland Biosecurity Capability Review of 2015. It was not just a review of the fire ant program but the whole of Queensland’ biosecurity capability. SA So you think the Federal government should not give the money to Biosecurity Queensland but ask the federal Department of Environment to take over the program? PS Even the State department. When Biosecurity Queensland was mooted, it was (intended) to be a separate agency. Other people have suggested that the Commonwealth should take over biosecurity or make a stand-alone, independent biosecurity agency in Queensland. At least, give (the fire ant program) to a different government department in Queensland. SA And if the federal does next year give another $350m to try to stop the ants from spreading (Biosecurity Queensland) will be repeating the waste and mistakes from the past. PS And the Commonwealth’s oversight. There has been no Commonwealth oversight of how that money has been spent for the public good. Whether it’s been spent carefully. The Capability Review said (that Biosecurity Queensland tends) to spent on high cost things instead of more strategic things. The Capability review was very critical of how Biosecurity Queensland has wasted its funds. SA Dr Pam Swepson, thanks for your time. SA Barnaby Joyce is Federal Agriculture Minister and Deputy Prime Minister. Deputy Prime Minister, who is telling you that the fire ants can be eradicated since they dug-in in 2001? BJ A number of times a year we have Ministerial Councils where the Agriculture Ministers get together. (The fire ant program) is a nation-wide program because we know that if it gets out of Queensland it will go right across our nation. It’ll have a major effect (and cost) billions of dollars: $48-50b, I think, over the next 7 years. SA Queensland has spectacular failed to eradicate (fire ants) them and it has cost millions of dollars…. BJ In one area: yes. They haven’t spread. We believe we have them contained in south-east Queensland, but we’re not eradicating them. We did have another outbreak, of course, at Gladstone, which we did eradicate. So, it’s a case of: in one area it’s proven more difficult than the other. And we have to try to keep all the States on board because it can’t just be a problem for Queensland. The State boundaries are just an arbitrary line on the map. Ants don’t care about it. BJ And they have the capacity to go across our nation: which they will do. They will completely change (the) ways we (like) to re-create. And (they will) also have massive effects on our flora and fauna and on agriculture. SA There’s no doubt that the impacts are significant, but I’ve just spoken with a former whistle-blower who used to be involved in the program. BJ Yes, I heard Dr Pam. SA And her criticism has been for quite some time that the science is being misused to try to eradicate or contain them. And so far, $400m of Commonwealth funds have been spent and you have been asked to spend almost the same amount again over the next 10 years. Has the Commonwealth examined how Queensland has spent the money so far? BJ Well, our Department does that all the time. I personally don’t profess to have the expert knowledge to know that by my own deliberations. So, I rely on the advice of the experts. But I’m willing to have a yarn to Pam, to Dr Pam, if she wants to have a yarn with me and give me other ideas. SA We’ll pass on the details. So far she’s been fairly accurate with some of her criticisms.